Washington, D.C., circa 1920. 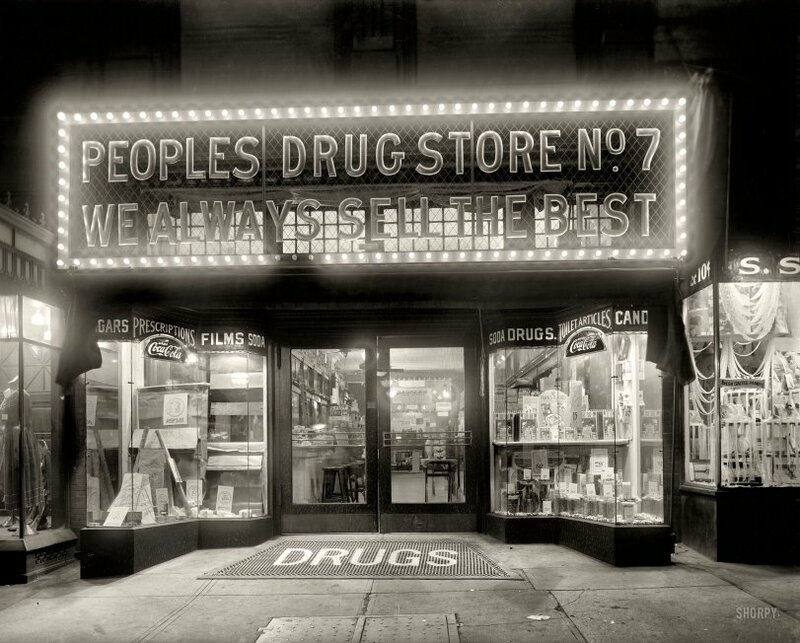 "People's Drug Store, 11th & G streets, night." National Photo Company Collection glass negative. View full size. They'd have to sell a lot of "juvenile candies"
Submitted by mad4books on Sat, 12/05/2009 - 7:09pm. to pay that electric bill! Submitted by Steven Hall on Sat, 12/05/2009 - 12:04pm. I lament that store windows have in general declined in their displays, at least around here. I see so many drug stores, corner grocery stores etc. that have their windows plastered with posters (mostly faded) advertising phone calling cards. Submitted by Grey Hawkins on Tue, 12/01/2009 - 5:56pm. Somebody opened the right hand door while this was being taken, creating quite an interesting effect with the interior lights! Submitted by Cidny on Mon, 11/30/2009 - 6:27pm. I'd like some "toilet articles," please. Submitted by CJkc on Sat, 11/28/2009 - 3:26am. have come a long way since this sad looking grouping. The "Fresh Salted Peanuts" stuck to the outside of the glass is a nice touch, too. Submitted by tinag on Fri, 11/27/2009 - 8:30pm. In the early 1980s I worked near a People's Drug Store in Foggy Bottom. There was still a lunch counter (where I discovered that their chocolate shakes were the best cure for a hangover). I used to tell my sister, who was away at college, that I was eating lunch at the "People's counter" and finally she asked, "What is that? Some kind of communist place?"